Specialist scientific fields are developing at incredibly swift speeds, but what can they really tell us about how the universe began and how humans evolved to play such a dominant role on Earth? 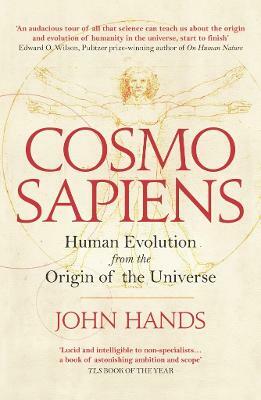 John Hands's extraordinarily ambitious quest brings together our scientific knowledge and evaluates the theories and evidence about the origin and evolution of matter, life, consciousness, and humankind. Cosmosapiens provides the most comprehensive account yet of current ideas such as cosmic inflation, dark energy, the selfish gene, and neurogenetic determinism. In clear and accessible language, Hands differentiates the firmly established from the speculative and examines the claims of various fields such as string theory to approach a unified theory of everything. In doing so he challenges the orthodox consensus in those branches of cosmology, biology, and neuroscience that have ossified into dogma. His striking analysis reveals underlying patterns of cooperation, complexification, and convergence that lead to the unique emergence in humans of a self-reflective consciousness that enables us to determine our future evolution. This groundbreaking book is destined to become a classic of scientific thinking. John Hands has devoted more than ten years to evaluating scientific theories about human evolution from the origin of the universe. He graduated in chemistry from the University of London and co-authored two research studies and published one book in the social sciences. He was the founding Director of the Government's Co-operative Housing Agency and served on three Government committees. He has tutored in both physics and management studies for the Open University and was Royal Literary Fund Fellow at University College London.